Frederick City Aldermen voted 4-1 on November 20th to approve the use of speed cameras. Alderman C. Paul Smith who was the sole vote against the cameras, expressed a concern that he had no idea how many cameras might eventually be installed. Mayor Jeff Holtzinger said that he expects the city would make a "boatload of cash" if it put speed cameras along Key Parkway or Shookstown Road. Some city aldermen previously expressed a concern that limiting the cameras to school zones was too confining, but Police Chief Kim Dine said the half-mile radius and the number of schools in the city would create a large area for cameras to operate... indicating that the city may follow the lead of Baltimore and invent new school zones to install cameras in. Berwyn Heigths has begun selecting locations for its speed cameras. The council already selected Pontiac Street and Edmonston road. The existing 15mph speed limit on Pontiac Street would mean the city will hand out speed camera tickets to drivers who are traveling at the reckless speed of 27mph. The city is planning to create a new school zone on Edmonston road and and expand the existing school zone on Pontiac Street, "Edmonston Road has a tremendous amount of volume, but it's not currently in a school zone," Mayor Calvo said. The town will also ask the SHA for approval to put the cameras on Greenbelt Road (a 6-lane state highway), running from 62nd to Kenilworth avenues. The town has been in discussions with Optotraffic/Sigma Space about using dual red-light/speed cameras. Optotraffic conducted a study for the town to see which locations could ensure a minimum 616 tickets per month (30 tickets per day), since neither the city nor the contractor are willing to accept an arrangement unless both are assured to make money. Under the deal Optotraffic would keep $16 of every speed camera ticket and the town would keep all of the remaining revenue up to 10% of the town's current total budget. Berwyn Heights residents will have a chance to voice their opinions at the Dec. 9 town meeting. 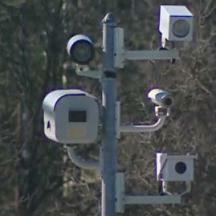 Sykesville (Carroll County) is conducting a study to see if the cameras are viable. 'The Traffic Group, Inc', a Baltimore-based vendor, will do the study free of charge. Town officials will receive the results of that study in their Monday, Nov. 23th meeting. The City of Laurel has begun discussing speed cameras as well, and is investigating whether they will be cost effective. The city's camera's would be in addition to the freeway speed cameras which the state has set up on 65mph I-95 at the ICC construction site.